Fresh bright lemony flavor of these Lemon Ginger Snaps is a fun twist on the classic holiday cookie. A couple of weeks ago I invited my mother-in-law to go to IKEA with us. She had never been before, so I insisted she had to come along! After about an hour of shopping, we decided to head over to the cafe and grab a snack. Since it was between meal service, I opted for a yogurt and a water; she finished checking out and met us at the table with some of the PEPPARKAKA Citrus Lemon Ginger Thins Cookies. I’m usually not much of a cookie person, but ginger snaps have always been one that I love and these IKEA citrus ginger snaps are quite delicious! My little girl had a blast strolling around the store and munching on cookie pieces (she was kind of cranky, so I let her have some). After we returned home and the cookies were all gone, a week later I found myself craving some more. The closest IKEA is about 45 minutes to an hour away, so I decided to try my hand at recreating them. I like to use honey in my ginger snaps instead of molasses, but either works fine; the color is the biggest difference. 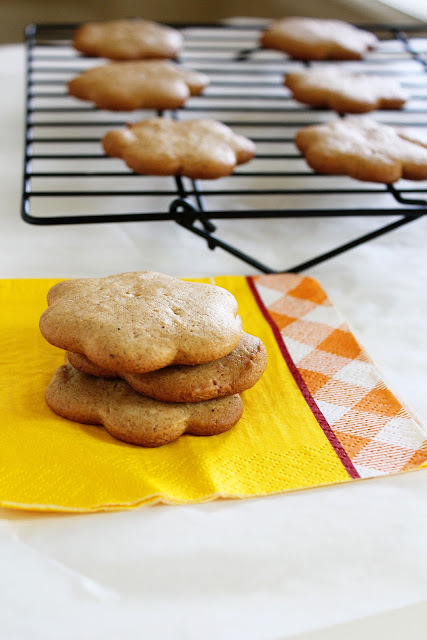 My lemon ginger snaps weren’t as thin and crisp as the IKEA ones, but they sure were tasty. Lemon oil is the secret to these fresh, gingery snaps, I hope you’ll bake yourself up a batch to enjoy – happy baking! In the bowl of your stand mixer cream the butter and sugar, then beat in the egg, honey and lemon oil. In a separate bowl whisk together the flour, ginger, baking soda, cinnamon, cloves and salt. Add the dry ingredients into the wet and beat to on low to combine. Refrigerate the dough for 1 hour. Preheat your oven to 350º and line a baking sheet with parchment paper. Roll out to 1/4" thick and cut into squares or with cookie cutters into desired shapes. Bake for 10-11 minutes, remove from oven, cool on the pan 5 minutes, then transfer to a wire rack to finish cooling. I can no wait to try these! You need to post this recipe on todays Blog Hop Recipe Swap! This look delish. Never thought of using honey instead of molasses. Glad I found you through Recipe Swap. I followed you! These sound delicious!! Lemon is one of my favorites. I would love for you to link up to my linky party at The Mandatory Mooch. Still open for another day!! So pleased to have you Ellen! These look so delicious! I am so glad that you shared this with us this week! Have a good one! Hmm…mine turned out very dry even though I reduced the cooking time (second batch only in for 6 min!). Maybe better with a frosting or something or adding moisture somehow.